It's summer time and you need to get out of town, but your job has cut your hours (or even worse, you've been laid off), and you can't afford to fly somewhere, go on a cruise, or get a hotel room and drain your savings. Your girlfriend is bummed and your summer vacation is ruined, right? Think again. With the economy in recession everyone is finding ways to do more with less money, and your summer vacation is no exception. A recent New York Times article found bookings at certain national parks up 30 percent. With some of the world's most stunning scenery and excellent trails, America's state and national parks are truly underrated. A smart investment in quality, inexpensive camping gear allows you to get outdoors and pays dividends for years. Now, it's easy to rent an RV and drive your bulky second home to a park, but where's the fun in that? The challenge and reward of camping lies in going beyond the parking lots and visitor centers and truly experiencing nature. A three or four day backpacking trip at stunning Bryce Canyon National Park (to name one) is a perfect vacation for the adventure-seeking and cash-strapped. All outdoor gear has just two purposes: To keep you alive and comfortable. Unless you're climbing the Sierra Nevada in California or hiking the Appalachian Trail you probably won't face any life-threatening situations, so comfort is king. You also need to convince your girlfriend that a tent is a reasonable substitute for a hotel room and a Zagat's rated bistro. With that in mind, you want your gear to do 3 things: be durable, lightweight, and inexpensive. Rule 1: Bargain gear is heavy, unreliable gear. Avoid brands like Coleman and stores like Target or Wal-Mart. Bargain gear may be cheap, but it won't last long and may break when you need it most. Rule 2: Determine the most extreme conditions you'll face and get gear that will hold up in situations that are a little worse. Rule 3: Try it before you buy it. You won't get outdoors year after year unless your gear fits well. A good trick is to go to your local outfitter, try on what you need, and then shop online for the best deal. 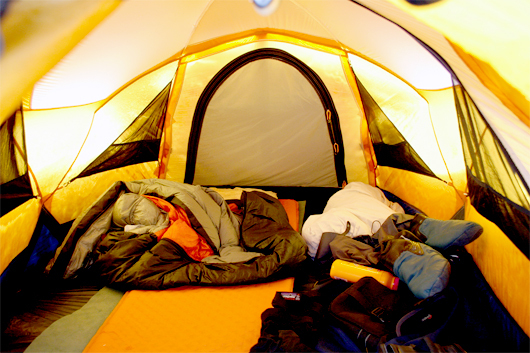 A tent is your home away from everything, and it's primary function is to keep you protected from wind and rain. It also needs to be roomy enough to comfortably sleep its occupants and have space left over for gear. With all the choices out there, buying a tent can be intimidating, but for spring, summer, and fall camping a single-wall freestanding dome tent is a good choice. A proven favorite for new backpackers is REI's Camp Dome 2 tent, for $99, which sleeps two and will last for years. Eureka is also a good introductory brand. 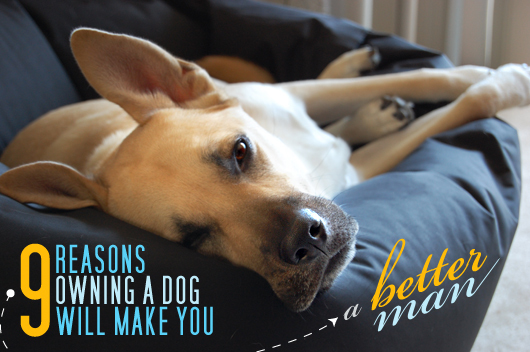 Check out REI's Expert Advice on choosing a tent for more info. With tents as with most gear, weight and cost are inversely proportional. The lighter and easier it is to haul, the more expensive it gets. 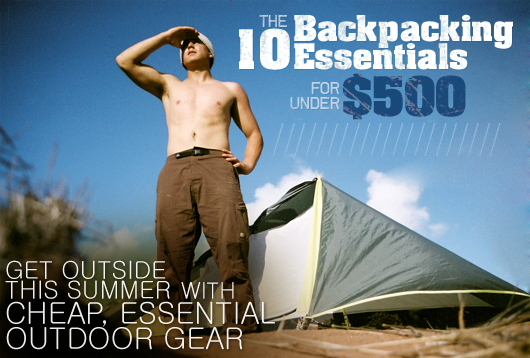 Perhaps more than a tent, a backpack is the costliest and most versatile piece of your gear. Also, like your boots, it needs to fit perfectly or it's going to hurt, so take your time in trying on and choosing one that suits your needs and your body type. REI has advice on finding the perfect pack fit. The size and features of your pack depend on how long you'll be in the backcountry and whether you'll be doing rock or alpine climbing, but most quality brands, like Gregory, Mountainsmith, Arc'Teryx, and Osprey will be similar in design. Unlike the rigid and uncomfortable external frame packs that your parents used, nearly all backpacks today are supported by a plastic or aluminum internal frame, which makes them more responsive to movement. For a two to four day trip look for a pack with a capacity from 40 to 70 liters (for longer trips, a 70+ hauler like the Gregory Palisade is a good idea). These packs are designed to place most of the weight on your hips, so when trying on a pack in the store fill it up to simulate a typical load and notice how it rides on your torso and shoulders. Next, evaluate the loading features. Most packs allow multiple points of entry, with a duffle-like top, long panel-loading pocket, and mesh side pockets for a water bottle or maps. Imagine yourself caught in a sudden shower and your waterproof shell is buried deep in your pack – how easy is it to access? For deals on packs, check Sierra Trading Post and this author's favorite, Campmor. A tent wards off the elements and a sleeping bag keeps you warm; it's a simple but elegant combination. Sleeping bags come in two types of insulation, down and synthetic, and while down is extremely light and insulating, it clumps when wet and loses its warmth. Synthetic insulators like Primaloft insulate even when wet and for this reason, as well as overall three-season functionality, most backpackers choose synthetic. After insulation, look for features such as a comfortable hood (necessary for the bag to retain heat) and an easy-to-use zipper. If you're a lefty, be sure to get a right-side zippered bag since you reach across your chest to zip and un-zip. All sleeping bags are rated. A 30-degree rating is supposed to keep you comfortable at 30-degrees Fahrenheit, but treat all bag ratings with suspicion. Ratings are not standarized and represent a manufacturer's best guess, not a scientific finding. If you're a cold sleeper, adjust your bag rating down by 10 or 15 degrees. Also, wearing thermals, a fleece, and a hat to bed – with the bag hood drawn tight – can really enhance your bag's warmth. Just try not to restrict blood flow to your extremities with layers of tight clothing or you'll defeat your extra insulation. Brands like Marmot, North Face, Kelty, and some Slumberjack bags are a good bet. Mountain Hardwear and Big Agnes are more expensive but excellent. Again, Campmor has great deals on quality bags. No discussion of sleeping bags is complete without an insulated pad. You lose a majority of your body heat through the ground, so it's necessary for warmth (and comfort) to have an insulated pad. Pads come in two styles: Closed-cell and self-inflating. Closed-cell mattresses provide the most insulating power per ounce, but self-inflating mattresses are often more comfortable. If you're camping in cold conditions, be sure to get a pad with extra insulation. Therm-a-rest is the industry standard, though Big Agnes makes quality pads, too. 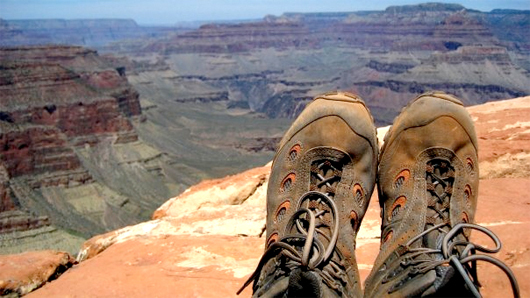 A sturdy pair of leather or synthetic hiking boots are your muddin' tires on the trail. Boots stabilize your ankle and absorb the shock of a 50-pound pack while giving you necessary traction on uneven and wet terrain. Like the three items above, boots can be expensive (a good pair will be at least $90), but given proper care represent a multi-year investment. For a 3+ day trip, look for a waterproof boot with Gore-tex and a Vibram sole. Brands to look for include Vasque, Columbia, La Sportiva, Lowa, and Scarpa. Knife choices are so abundant it can seem impossible to choose. Just remember: you have to carry everything you pack, so pick the smallest, lightest knife you need to get the job done. Swiss Army knives are a perennial favorite, but their blades aren't made with very high-carbon steel and often lack the aggressive styling for serious cutting and chopping. This author favors Gerber blades, but any quality folding or full-tang knife will do. A multi-tool is more useful as an all-around backpacking utensil, as it combines a folding blade with scissors, screw-drivers, pliers, and, on deluxe models, a wood saw and tweezers. For making repairs in the field and light cutting tasks, a Leatherman or Gerber multi-tool can't be beat. Unless you're backpacking through Death Valley in July, you'll need rain protection on the trail. While any waterproof Gore-tex jacket will get the job done, a lot of truly waterproof shells can be very heavy (as in, multiple pounds instead of ounces). While cutting weight will result in fewer bells and whistles – fewer velcro closures and drawcords for adjustments, possibly no pockets or pit vents – and less durability, since the shell will be thin to save a few ounces, it's worth it to save your back and knees. Outside online has a few recommendations for under $200. Staying dry and comfortable in the backcountry can be a challenge. Rain, sweat, and humidity all conspire to make you clammy, damp, and miserable. Enter: layering. The basic idea is this: You start the day's hike on a cold, wet morning wearing a light base layer that wicks moisture away from the skin, a mid layer of fleece or wool to insulate you from the damp chill, and a shell to keep the water droplets out. By mid-morning you've worked up a sweat – off comes the shell. By lunchtime the sun has come out and suddenly you're sweating – lose the fleece mid-layer and let your wicking base-layer keep you cool and protected from the sun. EMS makes a great, inexpensive base-layer called Techwick. Fleece can get expensive, but brands like Patagonia and Mountain Hardwear will last for years (and work as an outer layer in dry, windy conditions). A hot meal at the end of a long day on the trail is good for your conditioning as well as morale. 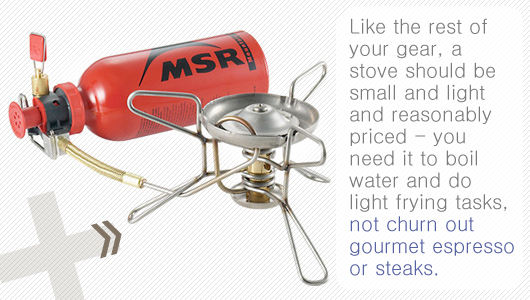 Like the rest of your gear, a stove should be small and light and reasonably priced – you need it to boil water and do light frying tasks, not churn out gourmet espresso or steaks. There are myriad choices (find a good introduction at Zen Stoves), but MSR's Whisperlite and Snow Peak's Giga series are exceptional. For trail recipes that will fuel your hike and appeal to your foodie friends, check out the Appalachian Mountain Club's Fuel for the Long Haul. While a headlamp isn't absolutely necessary for backpacking, the minute you use one you'll realize that, in fact, it is. Weighing in at a few ounces and running for 100+ hours on LEDs and a couple of AAA batteries, headlamps are too useful not to have. Petzl is the industry standard, with the Tikka series ideal for backpacking. Since giardia is a risk for nearly every backcountry area and park in the US, you'll need a water filter if you're going to be on the trail for more than a day or two. Giardia causes diarrhea and painful cramping, and in a remote area can represent a serious threat to life, in a addition to being incredibly unpleasant. The upside is, with a relatively inexpensive water filter, you can prevent infection and the need to haul heavy water. Two favorites are Katadyn's Hiker Pro and MSR's Miniworks EX. Alternatively, iodine/chlorine tablets will purify water but not remove silt and debris. This gear represents the investment that you make in exchange for years of use in the backcountry. There are a few more things, like a compass and maps, that are essential but inexpensive. Take a look at REI's 10 Essentials for such items. More important than the gear, however, is getting outdoors – whether to find adventure, hunt, or simply find a change from the hotels and shopping humdrum of a normal vacation. Do research and find your own deals, and then hit the trail! Stillman Brown is a freelance writer and photographer based in New York City. He has backpacked and climbed widely on the eastern seaboard, Utah, Arizona, and Montana. His favorite spot remains Glacier National Park, MT. Great article. I would definitely include a campfire fire starter kit (http://camping.lovetoknow.com/Campfire_Fire_Starter) as part of the gear. Naturally, don’t forget to get a map and compass if you are going off the trailer tracks. (Yes, GPS would do too). GPS would be great – but if you’re roughing it out in the wilderness, you’ve got to go with a compass – or maybe only the sun! Old school baby. Great article Stillman – well done. If you’re going to spend the time with a true outfitter to ensure your gear fits, man up and purchase it from them too. Unlike sporting goods stores, these employees know their stuff, and that knowledge is worth something. You get what you pay for, and karma, baby. Great article. I might even ditch the stove for some quality matches and spend the extra other places. BTW I have an espresso maker for my dragonfly stove… it’s worth the weight in the morning. Hey guys, thanks for the comments. K, you’re absolutely right about the fire starter, GPS, and maps. I was focused only on the traditional big-ticket items, but throw in a GPS or PLB (Personal Locater Beacon) and you’re talking big money! Bill, you’re absolutely right about supporting your local outfitter. Sometimes, unfortunately, their prices are just a little too steep for me and I head for the ‘net. Chris, share the link for your espresso maker. Maybe my next piece should be on lightweight luxury items (that help with luring your girlfriend into the backcountry, too). Stillman – I think you could put together a pretty awesome (and innovative) article on budget luxury items to get your lady-friend out there in the wilderness with you (easier said than done). .-= Matt´s last blog ..How Far Are You Willing to Go for Your Dream Job? =-. Backpacking in general is not a cheap hobby. Buying all of the required equipment can be somewhat costly. The three essential things every hiker needs are shelter, sleeping bag, and a backpack. Do a little research to find exactly what you need and then you can compare prices and figure out just how much it is going to cost. great article! however, as someone who has guided in the ADKs for four years now, i would caution against going for a ‘minimalist’ shell. I tried one for a summer season and started hating myself for the lack of pockets, hood adjustments, and (especially) pitvents. also, as a sidenote, i’ve found that the cheapest and easiest way to purify water is a little jar called ‘polar pure’. It’s basically a small jar with a few iodine crystals in the bottom. You fill the jar with water to make a concentrated iodine solution, and then add a capfull or two to your nalgene. When the solution runs out you just add more water to the crystals and keep going! It’s SUPER CHEAP. i spent twenty bucks on mine a few years ago and it still hasn’t run out. WAY cheaper than buying a filter and then more replacement filters, and much more comfortable than running out of iodine pills mid trip! Gotta agree 100x with Bill. To me, going to a store and having them give you good service is worth the additional 5% you may spend vs online. Nowadays the stores are watching online prices anyway, so it is hard to find a better deal + shipping. Also, if you ever have an issue, the store is generally more willing and able to help you come to a solution (repair, return, upgrade). Shop local! kenetic chargers and solar… essential in case your communications are easily viable, towers are a plenty now days. At GearTrade, we stock exclusive Quechua Backpacks with up to a 10 year guarantee. Enjoy FREE delivery over £70 & Click and Collect, shop now!! Before start any activity we should take some essential Outdoor accessories .